Spring Sale for Kids of ALL Ages: Get One, Give One FREE! 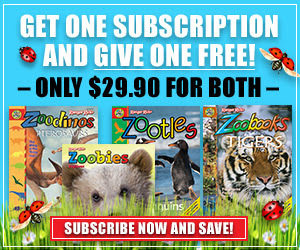 Only $29.90 for both subscriptions plus FREE gifts they will love with each subscriptions. From NOW - JUNE 20th, you can get 2 subscriptions for the price of 1, and receive FREE gifts with each subscription. Ranger Rick Zoobooks is the everything-you-wanted-to-know-but-didn’t-know-where-to-look children’s resource for animals. Each Ranger Rick Zoobooks explores the anatomy, habitat, socialization, and ecological role of a single animal or animal group in a vibrant, easy-to-understand way. TheRanger Rick Zoobookstrademark design combines stunning photography with beautiful life-like illustration and captivating text that kids just love – guaranteed! Critters Up Close, durable board books about animals for young explorers 0 to 3 years old.